Listed below are the props that the club owns or has access to. Stage designers can refer to this list when designing stages. Remember that IDPA matches typically have 4 stages total all set up at the same time and we have to share the props among those stages. For mini-IPSC we shoot three or four stages and at most two stages are set up at any one time (we also don't have a lot of manpower available for setup). This list is by no means complete, send corrections, additions, and deletions to webmaster. Think you have a good idea for a match? We'd love to hear from you. 2x Cantable Stands - one low (1.5ft? ), one tall (3ft?) adjustable cant metal stands. 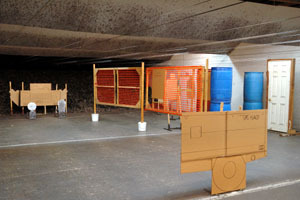 16x Metal Stands - standard metal target stands, single target. 19x Wooden Stands - homemade wooden target stands, single target. 2x Small Drop Targets - "stop plates" from Man vs. Man, approximately 1 foot high. 4x Tall Walls - Approximately 7' high by 2' wide, free standing. 2x Medium Walls - Approximately 4' high by 2' wide, free standing. 2x Medium L-Shaped Walls - Hinged 2 piece walls, with ports (Man vs. Man low cover). 1x Door - Free standing door. 10x Blue Barrels - complete barrel with top and bottom, approximately 3.5 feet tall. 1x Blue Tube - Blue barrel with top and bottom removed, suitable for shooting through. 1x Horizontal Barrel Stand - Holds barrel horizontally approximately 5 feet off the ground, primarily for use with the blue tube. 1x Stuffed Bear - the "baby" is packed with enough lead to make it an arm full. 1x Car - Theater display of "Lightning Mc Queen" from the animated film Cars (before he added the "whitewalls").